Wafcol Light Salmon & Potato is a Hypoallergenic dog food, which has been carefully formulated to meet all the nutritional requirements of the overweight or less active adult dog that require a low fat diet. Enriched with the Wafcol Ultimate Health Formula, Wafcol Light Salmon & Potato provides all that your dog needs to remain healthy and active. 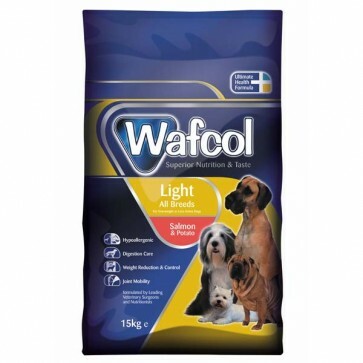 Up to 50% lower in fat & calories than standard adult dry foods, Wafcol Light provides a satisfying meal that is Higher in Carbohydrates to satisfy their appetites and discourage scavenging and begging, whilst providing all the essential nutrients. 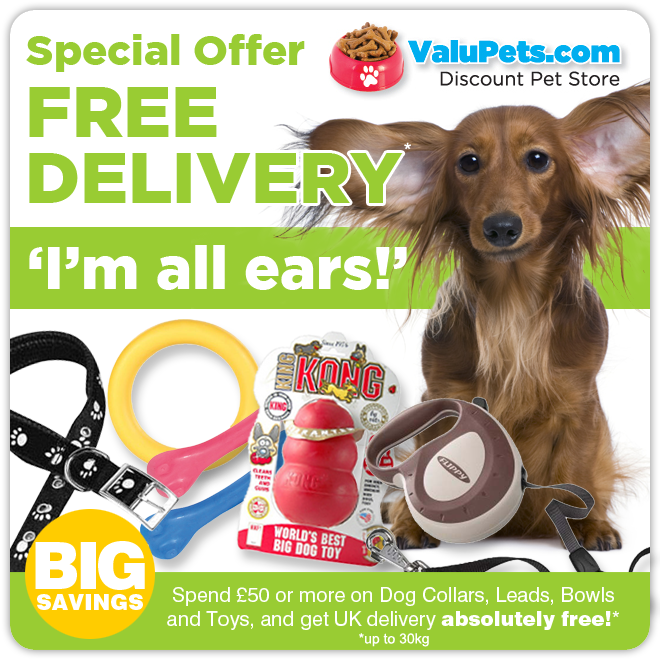 One in three dogs are thought to be overweight and face many of the same health problems that humans suffer from including, arthritis, reduced resistance to disease and a shorter life expectancy. 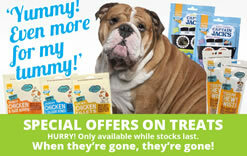 Consequently feeding your dog a low calorie, low fat diet like wafcol light salmon & potato can help reduce and control the weight of your dog, whilst reducing the risk of future illness caused by being overweight. Wafcol light salmon & potato dog food is a hypoallergenic, low calorie dog food that is Free from Wheat Gluten, Barley, Rye, Oats, Red Meat, Poultry, Dairy Products and All Artificial Colours & Flavours. 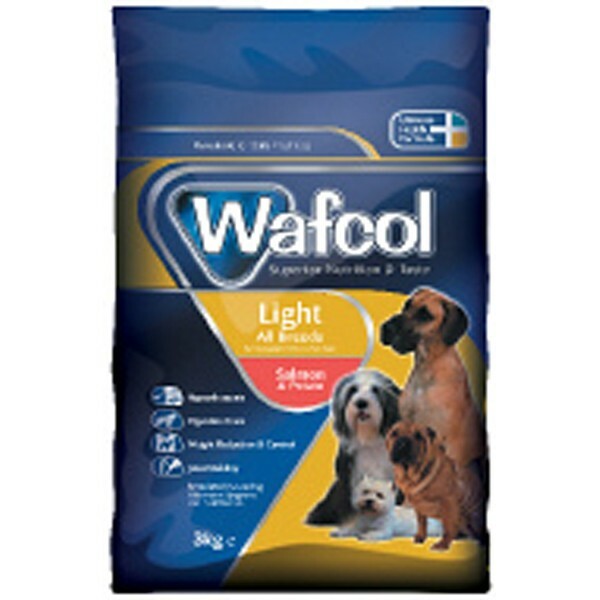 Wafcol Light has an appetising taste, which is highly palatable, easy on the digestion and is extremely useful not only to help reduce and control your dogs weight, but for the treatment of many forms of Colitis, as well as for dogs who Suffer Loose Digestion and contains prebiotics to help remove harmful bacteria and help reduce digestive upsets. Salmon is used as the primary protein source which has a low antigenicity rating and therefore less likely to trigger an adverse food reaction, than red meats commonly found in most dog foods. Potato is used instead of rice as the primary source of digestible carbohydrate, that is a good source of both digestible and indigestible fibre that will provide your dog with a steady release of energy throughout the day. The symptons of food allergies may vary, from Diarrhoea to Skin Inflammation, where allergies occur a dog food must be offered that excludes the allergen and your vet should be able identify any food related problems. Wafcol Light Salmon & Potato is less likely to cause an adverse food reaction than non-hypoallergenic, meat derivative based foods that may include unsavoury animal fillers, artificial colours and flavours. As many dog foods, including some supermarket brands do not specify exactly what you are feeding your dog, it makes it extremely difficult to exclude ingredients that may cause a food allergy or intolerance! Wafcol Light is Enriched with Bio-Mos, a Mannan Oligosaccharide, that helps strengthern your dog's immune system & improve nutrient uptake, reducing the risks of digestive upsets and giving your dog the correct balance of vitamins & minerals for a healthy active life. Wafcol Light also contains oils & minerals for joint health & compounds that promote an efficient anti-oxidant system to mininise joint inflammation. 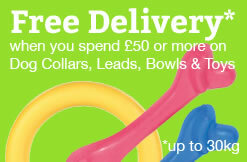 Fantastic service and although in Scotland was delivered as it said the next day lunch time. 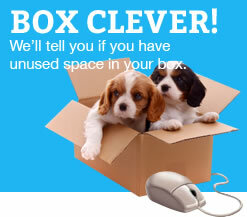 Will use again and my dog thriving on the food.